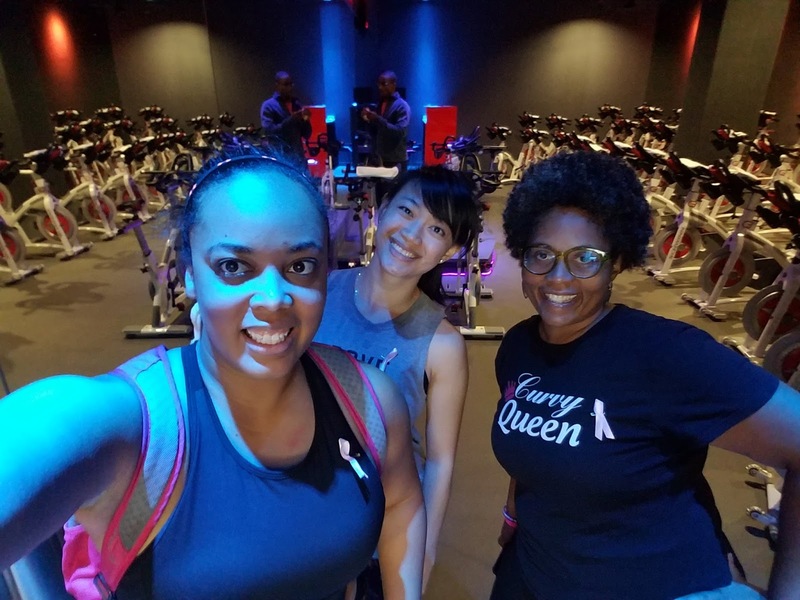 Two weeks ago, I joined my Sweat Pink DMV sisters and my buddy Esther for a breast cancer awareness event at Cyclebar in Arlington, Virginia. 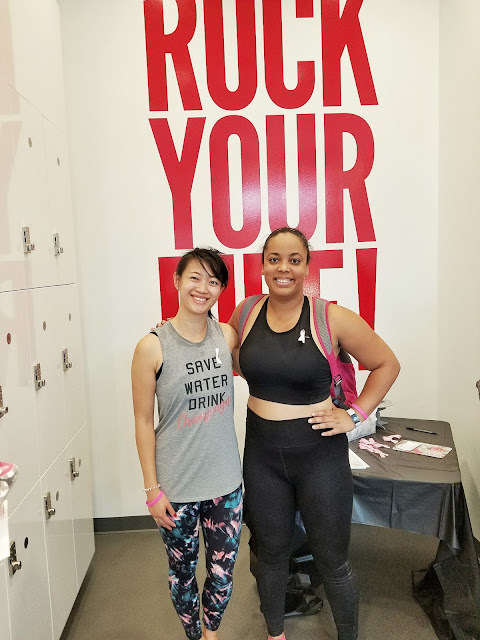 There was so much positive energy and sweat at the event, and I hope we raised a good chunk of change for the Breast Cancer Research Foundation! Because this was a Sweat Pink DMV event, I got a chance to catch up with my girl Vida of Healthy Curves Rock. I met her at Blogfest this year, and she always cracks me up! 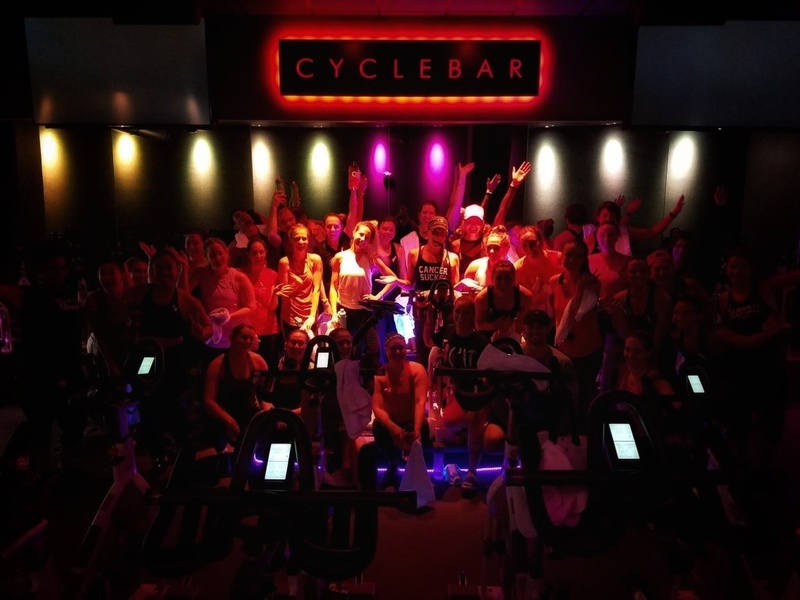 It was also Esther's first indoor cycling class ever! This was my second experience at Cyclebar, but my first time at the Columbia Pike Cyclebar in Arlington, Virginia. (My first time was in NoMa in DC.) 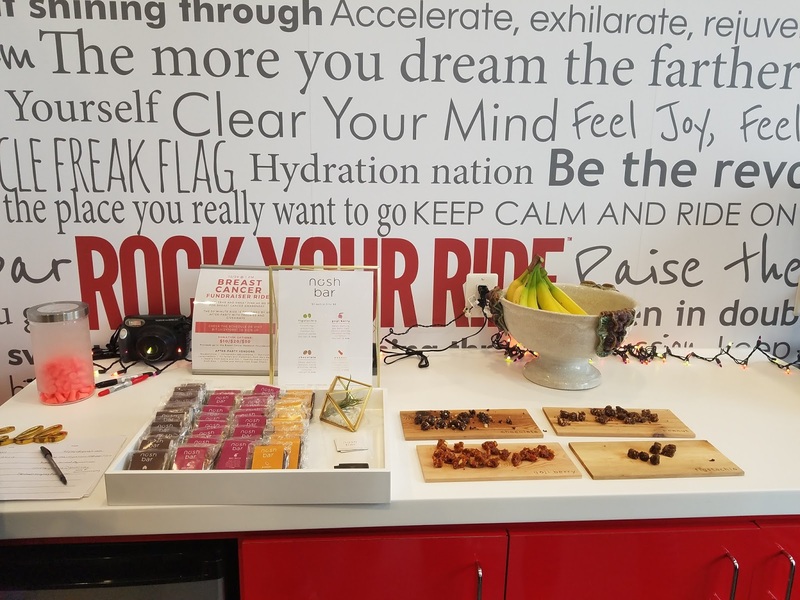 I have enjoyed both Cyclebar experiences, though I do have a few qualms. Mainly, I love that the studios are very clean and inviting, and that they email you your stats PLUS the playlist from the ride. I also love that they use Schwinn bikes, since those are the ones I used during my certification and they don't carry them at my gym. 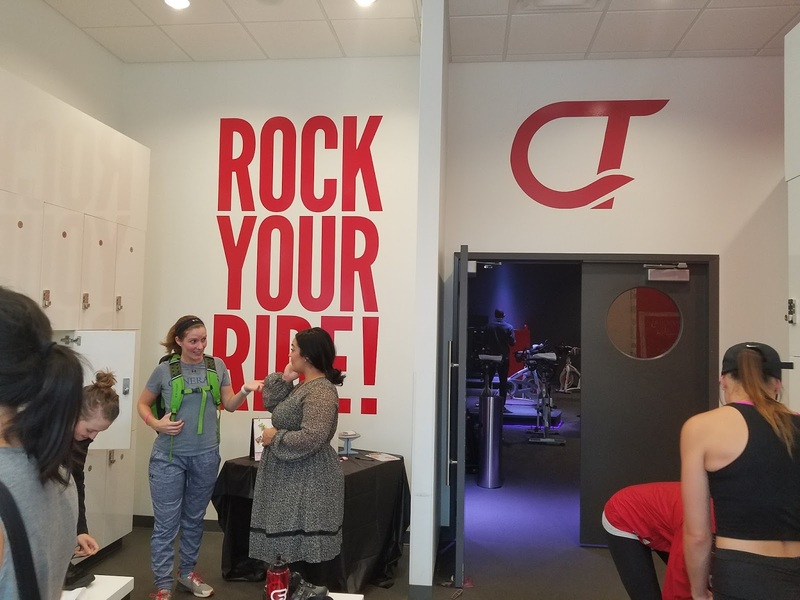 Cyclebar is definitely a premier indoor cycling studio. When we arrived, they hooked us up with water bottles that we could keep, shoes, and showed us where to check in on tablets. The front desk feels a bit like a concierge, and they make you feel like a special guest. It's nice, for sure! They had this cool machine that had water on tap, which made things a lot quicker and easier when you're rushing to fill up your bottle and head into class. The little things always impress me. What can I say? When we entered the studio, we had a towel on our bike, and I was able to get myself set up pretty quickly. Unfortunately, Esther and I were not on bikes next to each other, and I didn't realize nobody helped her set up her bike! She was set up in one of the back corner bikes, and I guess they overlooked her, which is a bummer, because if your bike is not fitted properly, you can hurt yourself! It was a major bummer when she told me that they never fitted her. I hope that's not happening to others! Anyway, the music was pretty good throughout the class. I will say that I've noticed that a lot of the boutique studios don't really do much hill work -- it seems to be all about the sprint. As much as I love the sprints, hills are also a super important part of the workout. 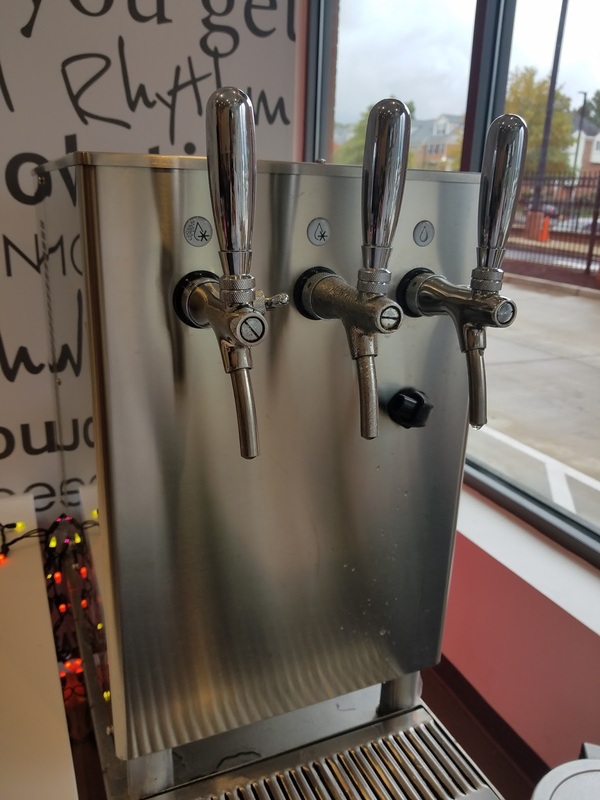 It seems like each studio has their "thing," and with Cyclebar, their thing is using a weighted bar for upper body exercises towards the end of class. 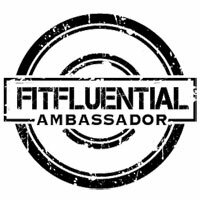 As a certified instructor, I have a big problem with lifting weights and doing "push ups" on the bike. Not only can you hurt yourself, but it also takes away from what indoor cycling actually is -- a lower body cardio workout. Anyway, I did modified versions of the workouts since I'm still dealing with my torn rotator cuff (and I'm a lunatic who had taken cycling classes and played volleyball pretty much all week that week outside of work). On top of that, I only had one bar option, and it was heavier than the ones I'd used in the past. In the other studio I attended, they had two options for you, and the bars were stored on the sides of the bike. In this studio, they had already picked a weight for you, and it was laid across your handlebars. Now, like I said, the class wasn't all negative. I really enjoyed it! I got my sweat on, got to wear my new crop top, raised money for a good cause, and got in a good ride with friends! 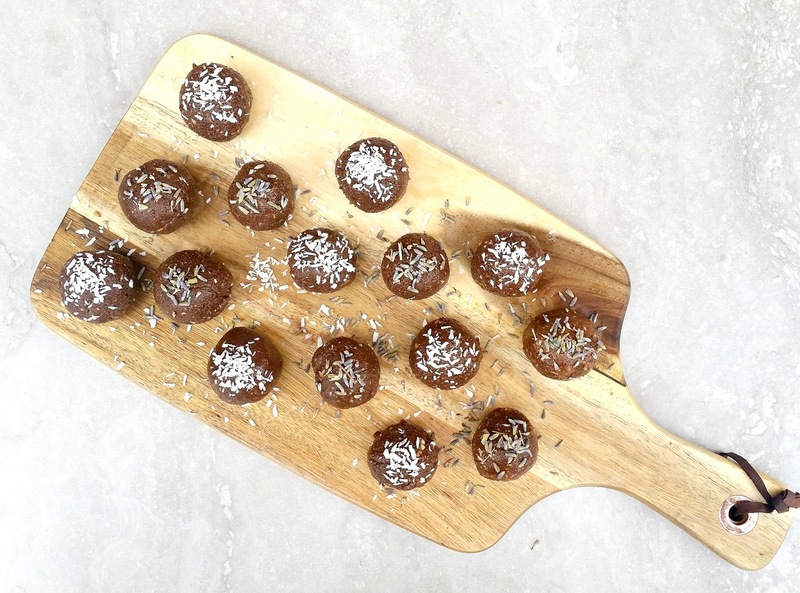 After class, there were a couple of tables set up with vendors from Mary Kay, Stella and Dot, Nosh Bar, a chiropractor with offices in Maryland and Virginia, and a nutritionist who hosts kombucha seminars. They were also snacks from Nosh Bar, bananas, and kombucha samples to enjoy after class. It was a nice setup! Have you ever taken a class at Cyclebar? What about other indoor cycling studios? What's your favorite part of indoor cycling class? 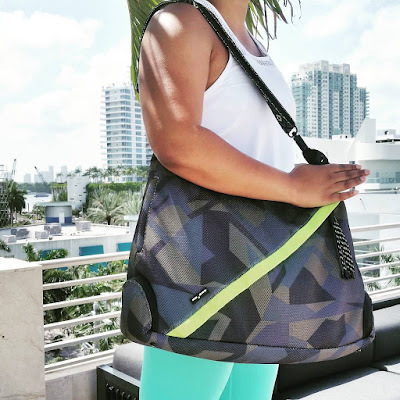 What's your favorite way to sweat with friends?